It’s the sailfish season here in the South Pacific so perfect timing to create a post about this very beautiful ocean creature. In this post, let’s discuss some interesting facts about the sailfish, their characteristics and how you can land the fastest swimmer in the ocean. Yep, they’re the fastest in case you didn’t already know! Sailfish (scientific name Istiophorus) is a carnivorous fish that can be found throughout the warm and temperate regions of the oceans. There are two main subspecies of sailfish – the Atlantic and Indo-Pacific. Sailfish can grow from 5.7 feet up to 11 feet and can weigh between 120 to 220 lbs. On average, a sailfish can live up to seven years. They appear to have blue-grey colour with white underbellies. They are called sailfish because of their enormous dorsal fin that spreads out like a boat’s sail. Their fin can go as high as the length of their body and much higher than the width of their body. This gigantic species is abundant throughout the South Pacific and their population figures are healthy. Though their tough meat has only minimal value in the market, sailfish is one of the most popular fish in recreational and sport fishing. As mentioned, sailfish is the fastest fish in the ocean. How fast are we talking here? The sailfish can reach speeds up to 110km per hour. If a cheetah could swim a sailfish would still outrun it! With their size and speed, sailfish can survive quite well on its own, however this species really thrives when travelling or hunting in groups. Often seen in groups of two or more, sailfish can work together to disrupt other schools of fish such as anchovies which makes it easier for the group to eat their meal. To trap smaller prey, they use their huge dorsal fins to create a fence. How smart is that? And to defend themselves from bigger predators, a school of sailfish use their sharp, pointed bill to pierce and slash enemies – if luck is on their side, that bigger fish would end up being their next meal. Although they are the fastest fish in the world, landing one is not impossible. Sailfish is the sport fish you should set out to land if you want a challenge – or perhaps a headache. To help you out with landing one of these elusive sport fish, here are some tips you might want to consider. How to Find One – Sailfish are migratory fish so they are always on the move, looking for prey. So, to get near to one you have to know which part of the year they thrive in a certain location. As mentioned earlier, it’s currently sailfish season here in Vanuatu (between June and August) but keep reading reports as seasons can vary in each fishing location. When it’s time to target a sailfish, you have to position yourself in an area that has a good current around a structure, like a reef or shipwreck. It’s also advisable to stay in areas with temperature breaks. There are a variety of baits that you can use when you want to land a sailfish. Sailfish are not the pickiest eaters so don’t be afraid to choose cheaper baits. For experienced anglers, however, they would choose either live or dead baits but if you have a higher budget, it’s better to get the live ones instead. Catching a Sailfish – Sailfish are very unpredictable because of their fast action and therefore catching them can be very tricky if you come unprepared. But the key to landing one is to work the same way that sailfish do when they hunt food – do it as a team. Don’t go to the ocean alone if you’re planning to hook a sailfish. When there’s a strike, someone should immediately grab the rod and someone should check and communicate what the fish is doing. Runs are to be expected and there’s no typical reaction to a hookup. The danger lies when the sailfish will start to attack the boat. When this happens, you should reel in the slack line as fast as possible and keep tabs on the fish. Also, the person manning the boat should be ready to move it – you don’t want to have a sailfish jumping on board. If the fish swims away from the boat, then it’s time for a chase – otherwise, the sailfish could easily wind the reel. Sailfish are large, so fight smart when you’re trying land it. Apply constant pressure on the fish and use the right drag setting. Use gloves when handling a fish near the boat to prevent injuries. 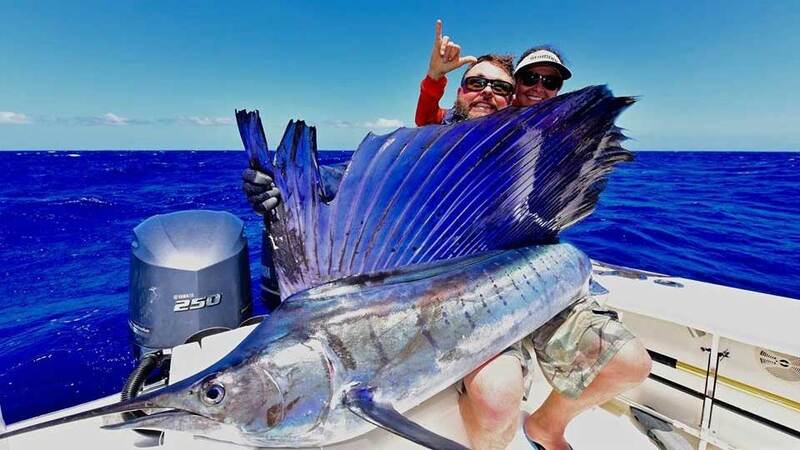 Unless you want to keep it, don’t take the sailfish out of the water. We hope that you have found these facts about sailfish informative. If you want to check out our latest fishing reports, or see pictures of our anglers in action then follow our FB page, Instagram, Twitter and YouTube.